Sure, it’s a big game. Class 6A’s top-ranked Derby Panthers open the season at home against Class 5A’s top-ranked Salina South Cougars on Friday. The game will be televised statewide at 7 p.m. Friday on Cox Kansas 22. Even so, don’t expect the players from either team to have a lot of pregame jitters. Each team reached the state semifinals in its respective class last year. Much of the same applies to Salina South coach Sam Sellers and his top-ranked Cougars. Derby enters with an abundance of talent back from a Panthers squad that finished 10-2 in 2012. Both losses came to 6A state runner-up Hutchinson by a combined total of four points. In tight end DeAndre Goolsby, offensive linemen Tanner Anderson and Cole Hansen, defensive back Travis Young, linebackers Caleb Arnold and Jose Delgado, running back Tyler West and kicker Kavan Mark, the Panthers boast eight players who are listed by Rivals.com as being recruited by Division I schools. Goolsby, in particular, causes some mismatches because of his size and athleticism. The 6-foot-5, 225-pound tight end is considered the No. 3 college football recruit in the state and has reportedly received offers from such schools as Florida, Ohio State, Oklahoma and Arkansas. Salina South returns eight starters on offense and seven on defense from a team that finished 10-2. 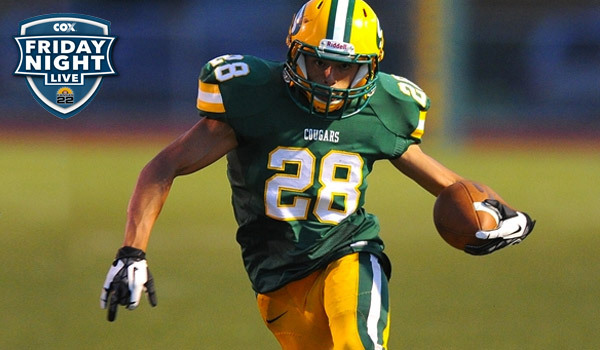 The Cougars’ only two losses last season were to Derby and eventual 5A state champion Bishop Carroll. With Mike Jones, the Cougars return a running back who rushed for 1,781 yards and 17 touchdowns last year. The speedster ran for 411 of those yards in a win over Great Bend. Justin Stonebraker returns at quarterback after rushing and passing for more than 800 yards last season. The game will be rebroadcast on Cox Kansas 22 at 7:30 p.m. Sept. 8 and at 7 p.m. Sept. 12. OL Cole Hansen, 6-4, 284, sr.
OL Tanner Anderson, 6-4, 248, sr.
OL Matt Kissinger, 5-10, 230, sr.
OL Kyle Haugh, 5-8, 232, sr.
OL Quentin Cox, 5-10, 230, sr.
RB Tyler West, 6-0, 210, sr.
RB Garrett Xanders, 5-6, 157, so. TE DeAndre Goolsby, 6-5, 225, sr.
WR Luke Palmer, 5-9, 155, sr.
WR Alex Knoblock, 5-7, 137, sr.
QB Jeremy Dunham, 6-1, 167, sr.
LB Jose Delgado, 5-11, 190, sr.
LB Brice Merz, 5-8, 161, sr.
LB Nathan Emrich, 6-0, 175, sr.
S Travis Young, 6-1, 191, sr.
S Caleb Arnold, 6-0, 205, sr.
CB Shane Fowler, 6-3, 191, sr.
CB Alec Martin, 5-10, 155, sr.
NG Blake Bradford, 5-7, 200, sr.
DE Kavan Mark, 6-3, 200, sr.
DE Jonah Packard, 6-0, 174, so. QB Justin Stonebraker, 5-11, 171, sr.
RB Mike Jones, 5-10, 171, sr.
FB Ryan Fox, 6-0, 220, sr.
WR Zach Nachbar, 6-2, 179, sr.
WR Mitch Roets, 6-3, 163, sr.
TE Walker Vinson, 6-3, 215, sr.
LT Doug DeWindt, 6-2, 251, sr.
LG, Seth Allen, 6-1, 243, jr.
C Trey Turner, 6-1, 204, jr.
RG Collin Salmans, 6-1, 290, jr.
RT Kevrick Cox, 6-2, 261, sr.
FS Cade Calvert, 6-0, 163, sr.
OLB Garrett Mortimer, 6-0, 186, sr.
OLB Richard Walters, 5-10, 172, sr.
CB Aaron Mar, 5-9, 163, sr.
CB Zach Nachbar, 6-3, 179, sr.
LB Cole Hoover, 6-0, 194, jr.
LB Dalton Harman, 6-2, 230, sr.
DE Ethan Mitchell, 6-3, 246, sr.
DE Braden Burlew, 5-11, 214, jr.
DT Alex Parker, 5-10, 225, jr.
DT Kole Smith, 6-3, 279, sr.